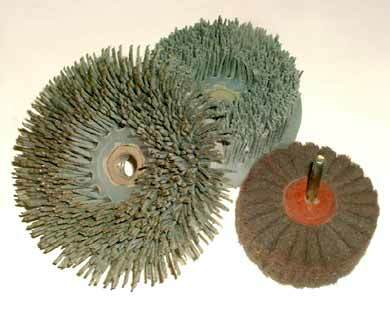 Reinforced silicon carbide abrasive wheels are commonly available in several sizes to fit right angle grinders. 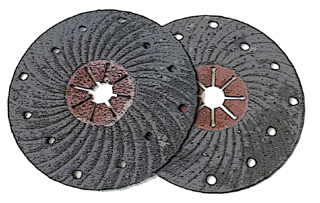 Most of the 'flat' discs have a depressed center so as to allow the hardware that attaches the disc to the grinder to be recessed when the disc is being used. In addition to the flat discs a cup grinding wheel is available. The discs are usually available in two or three grits, and in several sizes. 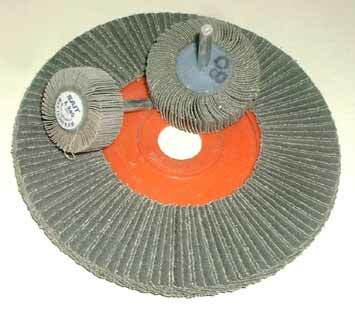 These type of grinding wheels are the most economical to use, but wear away fairly rapidly during use. 9" , 7", 4" depressed center wheel discs and a 4½" cup grinding wheel. 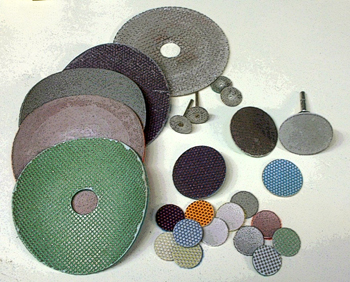 Most of the types of grinding accessories that are available in silicon carbide are also available in diamond, including flat disc grinding wheels, cup wheels, profiling wheels, sanding discs, and rotary burs. ZEC silicon carbide sanding discs have a spiral design that keeps the workpiece cool and ejects the dust efficiently. They are available in 7" diameter (shown at right), as well as 4" and 4½" diameters. Because they are designed to be fairly fast-cutting, they come in a limited range of grits including 16, 24, 36, 50, 80, and 120. 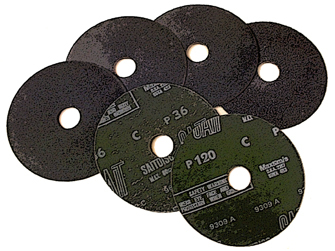 Silicon carbide resin-bond sanding discs are available in 7", 4" and 4½" (shown above) diameters. Though not as fast-cutting as ZEC discs, they are more flexible and allow better control over the contours of the workpiece. They are waterproof and come in a fairly wide range of grits. 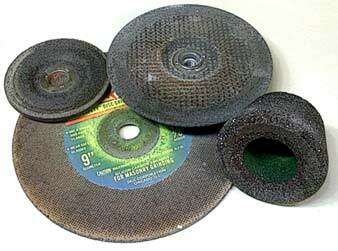 Silicon carbide abrasive sanding discs to fit right angle grinder/sanders are more flexible than grinding discs, so they allow a more uniformly contoured surface. The ZEC discs are made specifically for working stone, while the more common type silicon carbide resin-bond discs are employed for several materials in industry besides stone, including glass. 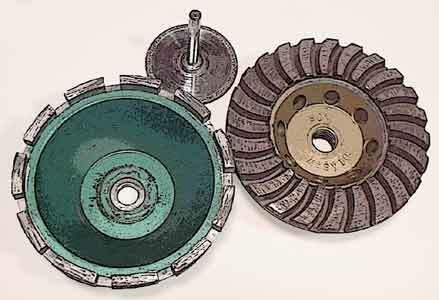 The flap sanders (above) allow a more even contouring of surfaces than a flat disc allows, while the silicon carbide embedded in the bristles of the brushes (at left) allow smoothing of irregularly textured surfaces. The fine 220 grit silicon carbide (at bottom right) pad feathers-out sanded surfaces much more easily than a disc allows. Larger sized silicon carbide belts allow broad flat surfaces to be more uniformly worked, while the smaller ones allow the interiors of grooved surfaces to be worked easily. 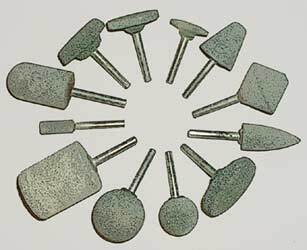 Shank-mounted silicon carbide stones allow working into hard-to-reach areas. 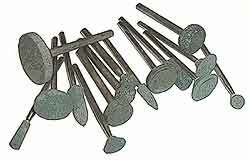 The larger 1/4" or 6mm shank stones are used in a die grinder or a router, while the smaller shanks are used in small rotary grinders and flexible shaft machines. 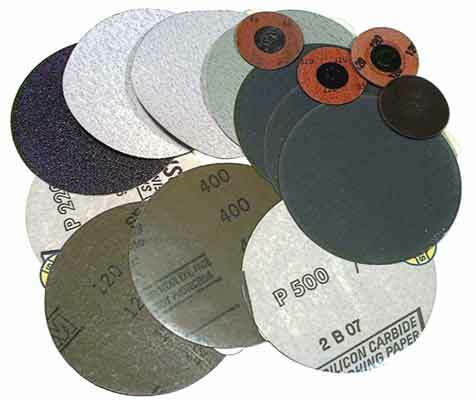 Silicon carbide sanding discs are also available in other sizes and styles, including 5" pressure sensitive adhesive (shown at right) or Velcro backed in both waterproof and dry cutting versions for random-orbit sanders. 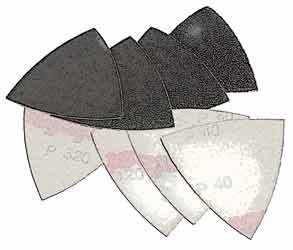 Also shown are 2" snap-on SiC discs for use in a die grinder. 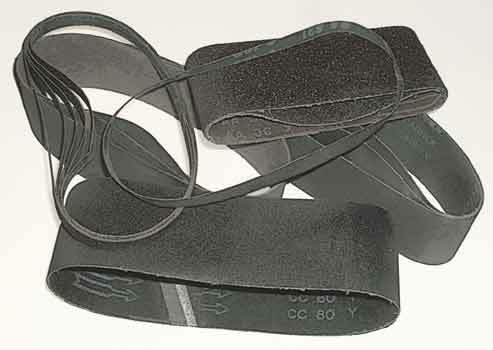 Silicon carbide is also available in Velcro-backed pads to fit oscillating detail sanders, or in a variety of sizes to fit portable belt sanders. 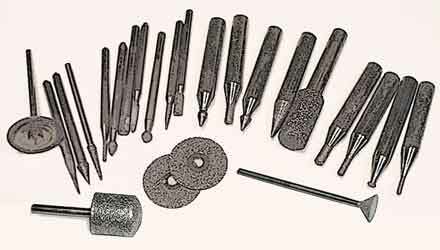 Silicon carbide abrasive is used in several forms that allow the user more control in specific working situations.